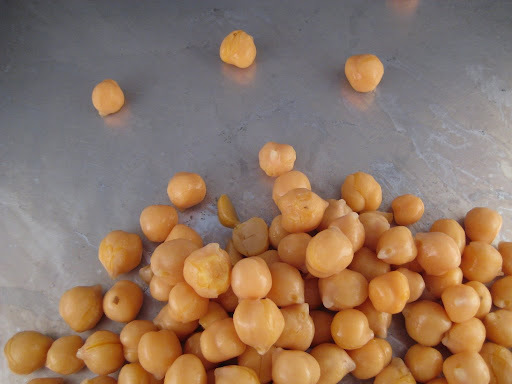 Months ago I bookmarked a recipe on AT’s The Kitchn for oven-roasted chickpeas. Crispy! Salty! Healthy! Last night I came home well before Ben was due back, and found myself rifling through the pantry in search of a bag of snapea crisps* I was sure were lurking there. I was wrong, and I found myself really wanting something besides salt & vinegar chips to snack on, so I finally pulled out a can of garbanzo beans and tried out the recipe. 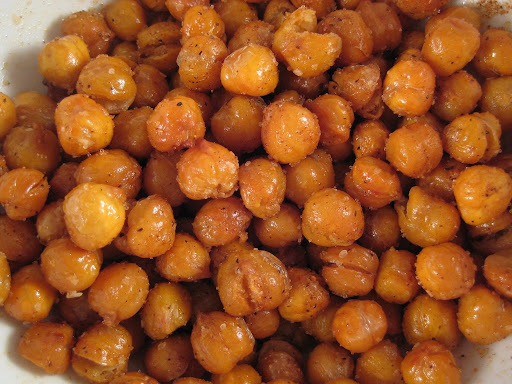 -Rinse a can of chickpeas (or two, if you’re a glutton like I am and you want enough to share) and blot dry (I actually skipped the blotting because I am lazy). 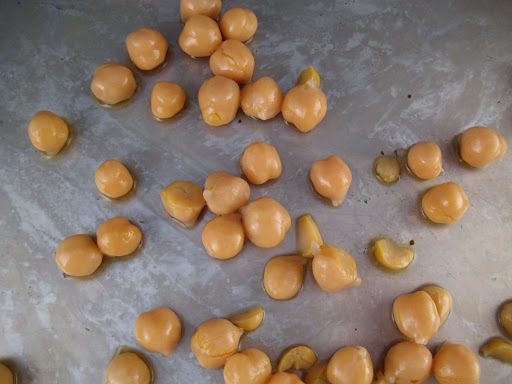 -Spread the rinsed beans on a cookie sheet (WITH SIDES, if you don’t want to spend the rest of your life fishing lost garbanzo beans out from under kitchen tables, shelves, etc.) and toss with a couple tablespoons of olive oil. -Roast for 30-40 minutes, shaking every ten minutes or so, until the beans are crispy all the way through. -Toss with salt and spices of your choice. I used a random jar of steak seasoning that I got at a Frankie & Johnnie’s Steakhouse event a while ago. The Kitchn used salt and garam masala. Next Time I might try something different, but they’re probably be good with plain old sea salt, too. 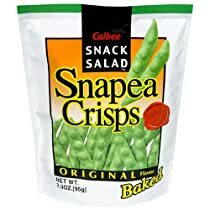 *You haven’t had Snapea Crisps? Dude. Ben thinks they’re gross but I can eat a whole bag at once, and I’m usually not a whole bag at once girl. They sell them at both Trader Joe’s and Whole Foods, I think? And they taste just like snow peas, but crunchy and greasy.